The technology industry is one of the fastest growing industries in the world. As producers strive to feed a continuously increasing global population, it’s no doubt that the agricultural sector poses a high demand for technological advancements. Drones are one of many current technological ideas being adopted to benefit today’s agricultural sector. The capability of drones to greatly improve efficiency in agriculture makes drones an attractive advancement in helping to ensure that agriculture will withstand a sustainable future. Although the concept of drones is not an entirely new idea, the ability of agricultural drones to allow for sustainability in terms of the environment, economy, and social aspect of society are factors that are backing the current excitement for drone use in the agriculture sector. A large amount of attention has been placed on drones and their evident capabilities to influence the productivity and efficiency of agriculture in North America. Although the hype of drone use in agriculture is currently a hot topic and a seemingly advanced addition to the sector, it’s interesting to find out that drone technology has actually been around for nearly a century. Initially developed with the intent to take down enemy Zepplins, the first drone design was developed in 1916. Although this drone did not actually take flight, modifications and differing intended uses continued to spark the advancements to several models of drones during the WWI-WWII period. For modern-day drones, agriculture is a promising industry for adoption. Despite the demand for drones however, access to use this technology isn’t easy. Drone use is highly regulated, as privacy and safety are a main concern of governments. However the increasing numbers of producers and agronomists adopting drone technology is forcing legislature to adapt alongside them. The first permit to use a drone for agricultural purposes issued by the Federal Aviation Administration of America was in January of 2015. These permits seem to be one of the only roadblocks in the way of drone technology becoming a new norm in agriculture. of the first UAVs ever designed for military use. Typical drone used in modern-day agriculture. Identification of pests, diseases and weeds. Collection of tissue samples tests for fertility & disease issues. Collection of soil samples to test for soil, fertility, pH & pest issues. Digging up plants to inspect plant root structure for signs of compaction, depth, disease, pests. Measurements of erosion channel width & depth. Notification of machine issues & other visual defects. Counting plants to determine population & spacing issues. Conducting exploratory excavation to determine drainage tile, depth, size & location. In bad weather conditions or low visibility areas with drone use things that can’t be seen with the naked eye such as; Crop health, soil water content, topography & field borders and pest& fungal infections become clearly visible. Much of the data that growers need to improve their decision-making can be made available with the right spectroscopy tools. The human eye can only detect a fraction of the information about an object that can be measured remotely. With properly calibrated imaging tools the difference between healthy and stressed plants can clearly be differentiated in bands beyond the visible spectrum. It may also be used for routine inspections and things such as map making & taking measurements. Night time animal herd (monitoring). UAVs use complex computer chips similar to those used in smartphones which can upload thousands of gigabytes of data though Wi-Fi hotspots. Drones could have a huge effect on improving environmental sustainability in the coming years in multiple areas of agriculture. One of them, is that drones are being equipped with multi-spectral cameras that can take several different types of pictures of the field and even overlay these pictures to create very valuable information for the farmer during the growing seasons. These pictures provide a range of information from plant health to soil conditions. While a crop is growing, the drone could detect a stressed area of the field; this stress could be from insects, disease, lack of fertilizer or others. Instead of the farmer treating the whole field for the issue, a farmer could use the maps to variable spray the solution onto the crops to solve the problem. This would decrease the farmer’s inputs on such things as fertilizers, pesticides, and herbicides, lowering their input costs and reducing stress on the environment. The use of drones to check fields or any other day to day observation tasks could be done by a drone, allowing the farmer to remain in one place, reducing his travel and fuel consumption. above is a drone being used to scout crops. Throughout the last couple of years California has experienced a very deadly drought, severely damaging the natural vegetation and crops of the state. Trials and testing have been done using drones to fly up into the clouds and conduct cloud seeding, a scientific way of increasing precipitation in clouds to lead to rain. The use of drones to do this method has sparked much interest as they can complete the process easier than traditional methods. In, summary, the use of drones has great potential to improve environmental conditions all around it and especially agriculture sectors. The use of drones could reduce inputs and increase outputs in almost every way it us used and reduce current strains upon the environment. The economy is constantly changing with the increasing advancement of technology. According to many agricultural specialists, 2015 will be the start of something special for the Agriculture industry. 2015 is the start of the drone era for agriculture, and the projections on the agriculture economy look positive. Some analysts project a huge jump in the economy as well as an increase in jobs added. According to a recent survey by the AUVSI (Association for Unmanned Vehicle Systems International), the Agriculture sector is the largest market for drones, accounting for 80% of all commercial use. 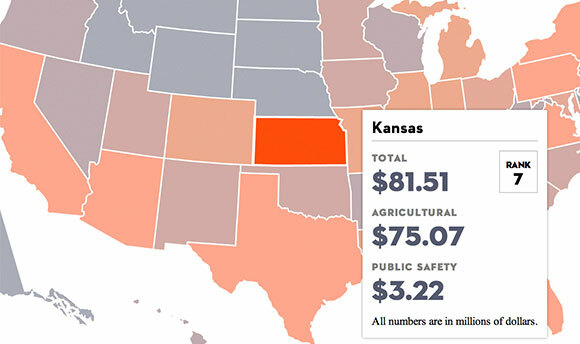 The study also mentions that the total economic impact on agriculture spending on drones in Kansas, is projected to reach over $75 million with 772 job created in 2015. The same study by AUVSI also estimated that the economic effect of allowing agricultural drones into the national airspace would be above $2.3 billion dollars and would create 12,000 jobs in California. The AUVSI just recently published a report that estimates that drones could have a cumulative $82 billion economic impact on the USA between 2015 and 2025. There are conflicting reports that between 80% and 92% of the commercial drone economy are from agricultural use. This means that drone use could give the agricultural economy a boost from between $65.6 Billion to $75.44 Billion in the next ten years. The inclusion of drones for agricultural use will help sustain and improve the agricultural economy for years to come. The graph above illustrates the estimated spending on UAV's and the projected economic impact of UAV's within the next decade. This diagram illustrates the economic projections for the areas which drones will benefit most in Kansas. This diagram assumes that F.A.A. regulations are in place. Drones in agriculture have many positive as well as negative impacts on social issues. Though drones could create a very self-sufficient family farm, giving producers more control and information on their crops, it could give more control to big agriculture companies. Currently the use of drones is not creating many solutions or problems, but in the future more social issues could arise. Many large agriculture companies could, with the use of drones, completely eliminate the family farm. If drones are able to monitor every aspect of a crop, there is no need for human intervention; unless there are stressed areas that need to be attended too. Conversely it will save product as well as money to not treat a whole crop when only certain areas need it. Although many jobs could potentially be created in order to create a basis for working drones, some jobs may be lost as well. As drones advance in precision agriculture, many jobs will be created. Programs will need to be developed in order for producers to use the drones effectively, the drones themselves will need to be built, and people will need to be hired to teach farmers how to use them, or be available for hire to operate the drones. As the technology develops in the future, it will be interesting to see what aspects of drones are issues and what aspects are solutions. Compared to scouting fields on foot, drones allow for a much faster way to monitor crops and collect agronomic data. Drones are also capable of detecting harmful problems such as weeds, pests and fungus, and applying chemical to individual problem areas before they get out of control in the rest of the crop. This advantage will potentially lead to less chemical use in the future, saving producer’s time and money. In addition, drones allow producers to know exact details on individual plants, which is virtually unthinkable with current technology. The fact that crop scouting can essentially be accomplished by an unmanned vehicle mitigates the need for agronomists and producers to walk through individual fields, reducing labour costs and enhancing efficiency in agriculture immensely. Current drone regulations are put in place mainly to ensure privacy and safety in the highly concentrated urban areas. However, the advantage of using drones in agriculture comes from the low concentrations of people scattered throughout rural areas, and thus lower potential concern for safety and privacy issues. There are fewer regulations for drones that fly over private land, which makes the process of using a drone much simpler in rural areas. The cost of acquiring a drone can be up to several thousand dollars for the producer, with the cheapest option costing roughly $2,000. In addition to the cost of owning the drone, training is another mandatory expense that producers must incur if they want to operate the drone themselves. The current uncertainty of legislation makes it difficult for producers to know the exact restrictions that they face when using drones. As technology continues to advance, there are virtually no limitations on what drones will be able to do to for the future of agriculture. Despite the limited use due to current regulations and restrictions, projections have already been formulated to guarantee environmental, economic and social sustainability as agricultural drones become more common throughout the sector. As producers face more and more challenges in feeding the world, efficiency is an element with room for continuous improvement. Drones have a promising future, as their core function is to increase efficiency in as many areas as possible, allowing the producer to focus on the finite details necessary to produce enough food for the growing population. Should farmers look into acquiring their own drones rather than hiring a company to croup scout for them? The choice for a farmer to purchase their own drones right now is kind of dependent on what the drone is going to be intended for. Equipping a drone to be capable of performing some of the agronomic functions listed above comes with a pretty large price tag. Since drones are still fairly new, and legislation is not completely clear right now, it seems like the idea right now is to let the agronomy companies acquire the drones, and as they catch on more and more farmers will most likely be able to justify the cost once the value is realized for an investment for the future! Your wiki was very well written, I appreciated the background information and the pros and cons section. You made a good use of pictures and I liked the captions on the diagrams to explain them. You also did a good job of explaining a wide range both the benefits and legislative implications of drone technology with statistics and interesting facts. Thank you so much for your positive comments! Thank you for reading our wiki. I really enjoyed this Wiki page, as I did not know much about drones to start of with. Question for you, you do mention that drones are quite pricy and people are unaware of all that they can accomplish with a drone, but a big "con" concern of my own is how often will a drone break down on you? will you spend most of your time trying to fix it and correcting its mistakes, as its only a form of technology, it might not have the same opinion as a human would. Is there a stat on how often people are trying to fix its mistakes? Most drones that farmers use will be owned by a company that will fly and interpret the results from the drone. Drones are fairly new in the agriculture business, and most farmers are not quite ready to switch over to drone use. Farmers are starting to find out more and currently if they are interested will hire a company to come out and fly their drone over the farmers field. The companies will have drone technicians that will take care and fix the drones, as well fix drones the few farmers will bring in. In the United States the FAA has strict rules that only let hobbyists fly drones. No commercial use of drones are allowed yet in the United States. During research there was no mention on mistakes, and mostly what the drones are used for is for surveying the vegetation on the farmers land. Thanks for the comment! Yes I also agree that the regulations are quite strict, especially in the US as drones are for hobbies only. Commercial drone usage in the US is not allowed at the moment, but lately, it seems like that will change very soon. Great Wiki, drones have always interest me. I've had experiences with Drones, there are times when I think that drones for advanced farmers aren't useful. The farmers can see with their own eyes where the areas on the field are nutrient deficient, do they really need to spend that high prices to get those areas checked out? I don't see a purpose for them. But for major chemical companies I do because they want to test out their product, to see if it actually works. Thanks. The idea with the drones being able to detect where the crop is stressed, is with a very large farm. If other things are more pressing that need to be done other than checking the crop, the drone would be helpful there. I see your point, but the drone technology, I read will be able to keep histories of soil issues as well. If the farm was to be sold, this would be useful for the buyer. Given the farmer would know all of this information in their head, but having a program have it all organized and a history would be an asset. Hope this helped, or at least gave an idea of where they could be more useful. It is true that technology such as this will be more beneficial to large scale farmers. However, Surveys for nutrient deficiencies and such are only a few possible applications for drones. They could be used for pesticide and fertilizer applications in the harder to reach areas as well. In the long term the benefits outweigh the cost. Great wiki, lots of information and very well organized. I agree that drones are going to be an important part of agriculture in the future. In your research was there any indication that the price to own and operate drones would decrease in the the near future? As with almost all new concept products the price is most likely going to be high right off the start when the demand isn't fully established yet. However, as drones become a more common addition to farming operations, the cost for companies to produce drones should decline with economies of scale. To answer your question, there weren't any specific guarantees as to exactly when the price of drones will decline, however just analyzing the trends of other technologies it is likely that as more demand is established we should see prices of owning and operating drones leaning to greater affordability for the future! Great information provided and very well structured. I enjoyed learning the history of drones and the picture of the 1916 aerial drone was interesting. I also was wondering if the prices of drone buying and training will decrease in the near future, but I see Nicole answered this very well in the John's comment. What are the cost differences between hiring an agronomist with a drone compared to hiring an agronomist without? I realize you focus on drones within Agriculture, but are other main uses for drones in other markets? You very briefly mentioned how they could be used to check on cattle. It is difficult to find cost differences between agronomists using drones and those who are not using them just because the legislation is still placing somewhat of a restriction on the use of drones. So to answer your question on the cost differences, unfortunately I couldn't find an exact number on the differences simply because this is still a pretty new market. However I did find an interesting fact that explained how drones have the ability to reduce the time it takes to scout a field by up to 60% compared to scouting on foot, so instead of an exact dollar amount for cost, it's kind of interesting to see the savings associated with a more efficient use of time! Agriculture is not the only market that is taking advantage of drone technology, tons of other companies including Amazon are using drones for "same day delivery", along with other companies such as pizza companies are also using drones for delivery purposes. Thank you for the comment, I hope this helps answer your questions! Awesome wiki, provided plenty of good information. I was wondering if you knew how pervasive drone use was in Saskatchewan at this time? And is it typically location centered (are farms closer to larger cities more likely to have access to a drone?)? As drone technology is a relatively new practice in the agricultural sector, it only follows that it would be first adopted in more developed areas of the world . So yes, at this time a greater percentage of the early adopters of this new technology are farmers closer to urban areas or larger scale commercial farmers who have easier access to drones. Most of the drone use in Saskatchewan however is still largely for hobbies and not agriculture. Nice Wiki, first time heard about drone using in agriculture area. From the graph above I can see application of drone in agriculture would be pretty profitable, and as time moves, scale effect dominates, the cost won't be growing too fast and profit is growing comparatively rapid, but this is only the data shows about US, how about Canada? will we have this kind of nice look graph? normally when a new product/technology is entering the market, it's not making money, kind of losing money, but when it stands for a enough long time, it will occupies enough market share and start making money. problems is if it's not making money at first when we introduce this kind of technology into Canada, what kind of policies do you suggest or expect the government will introduce? As for a lot of new technologies adopted first by the United states then by Canada, a similar trend will follow. The greatest issue with adopting new technologies in general is not the technology itself but rather the challenge of educating people and convincing them to forgo the old methods they have been implementing all this time. The Canadian government will surely create policies that prohibit drone use for commercial purposes in orderto create a new market and promote healthy competition. Because drones are a new technology, the nice graph is only projected numbers based on a survey in the US, so it is possible that these numbers might not be as high as once projected when everything is said and done. I could't find any graphs or survey results based on Canada, and as Zachry said, US adopts new technology first and Canada is usually follows a few years later. Great page, it is always nice to see new technology introduced in the agriculture market. It was mentioned that training operators would be a large part in the social sustainability of drones. Are there many producers who own and operate their own drone with successful outcomes? When I think of my Dads technological struggles, I find it hard to imagine him learning to operate a drone haha.. Do the producers offer lots of training, or are there programs out there to allow intensive training to those who want to own and operate their own drone? Mainly due to drones being used for agriculture, not many producers seem to have any quite yet. In the United States, the FAA has restrictions on drone use, which only lets people fly drones as a hobby. Currently in the United States, drones can't be used for commercial reasons. Recently there have been a few companies that recently got in the drone business. They are the ones who fly and process the drone info for the farmers. Agribotix is one drone company that has recently started a program called Bring your own Drone. This program is for farmers who have there own drones but need help processing the info the drone received flying over their farm. Very interesting, this summer I saw a drone being used for research ﻿purposes in a field and I found it very cool to see how it all works. Do you guys think that these drones will be starting to be used more and more for research purposes or stick to farmers using them in their fields for the reasons you listed? Also, under social responsibility I find it very scary that you said family farms could potentially start to get eliminated. I also think that because this technology is so up and coming the older generation of farmers may not catch on to this product because it is so complex and many older generations may have a hard time understanding this new technology. It may be hard to market towards them, what do you guys think? I suppose that is when you would hire someone to do it for you and not buy your own. I think initially drones will be used for research purposes, then move more towards every day use for farmers. And yes I agree that the older generations of farmers could rebel and not want to use this type of new technology, but if companies offer to run the drones for the farmers for the first couple seasons to show them how to use them and what they can do, that would be a good way of introducing it to them.